In machine vision systems, inspection of an object is done using a combination of sensor technologies – typically a camera – and an illumination source. Because the sensors on cameras “see” in 2 dimensions the amount of information that can be extracted from a single camera is limited. As we’ve mentioned, not only does the human vision system integrate information over time versus frame by frame in the electronic system, it can also sense depth, which is the third dimension. If the purpose of a machine vision system or automated inspection system is, for example, to determine the orientation of an object or calculate it’s conformance to a specification automatically, then having the third dimension is essential for accuracy. A useful technique to provide the necessary information about an object from which one can make depth calculations is to illuminate the object with a series of known patterns. This is typically done using a projection system as the illumination source. The use of projected images for this purpose is referred to as “structured lighting”. Since the pattern is known, distortions in the pattern – as captured by the sensor – can be used to calculate the 3D shape or measurements of the object. The image below shows an object illuminated by a pattern of stripes. Notice how the stripes are distorted by the curves on the object. If a series of different patterns are projected onto the object over time, then more detail can be calculated and the accuracy of the result is increased. If the object (or alternatively the vision system) is moving in a known way, such as rotated around an axis, or will travel a specific distance such that the perspective of the object will change during the capture period, then additional information can be extracted. When using a projector or projection system as the illumination source for a machine vision or automated vision inspection system there are several key requirements placed on the projector. The brightness of the system is important so that the bright and dark areas of the patterns projected are distinct. Brightness is also a factor in determining the distance of sensor from the object. The size and weight of the system are important in many industrial inspection systems. If the system is to be mounted on a robotic arm then a large, heavy system is harder to deal with and may drive the need for a larger and more expensive carrier system. The focal distance and depth of field of the projectors optics system is also important. They impact the systems ability to maintain a sharp focus of the patterns projected on the object. The projection system also needs to be programmable and support functions needed for integration with the intended cameras or sensors (such as synchronization and buffering). Combined, these factors: brightness, size, adaptability of the optics and suitability for the end application, all serve to impact system cost. Smaller, brighter and lower cost solutions tend to be advantaged in the machine vision market. Off-the-shelf projection systems are not designed with these attributes in mind. Most are designed to provide images for the human vision system from a digital source. So, special purpose projection or illumination systems are developed for these applications. Like the illumination system itself, the core of the projection system must be developed with machine vision & inspection systems in mind. Keith is a product manager and systems engineer at Keynote Photonics. He previously worked in Texas Instruments DLP division, helping multiple domestic and international customers launch products into the TV and Large-Venue markets. Is Your Company Keeping Pace with the Latest Display Technology? 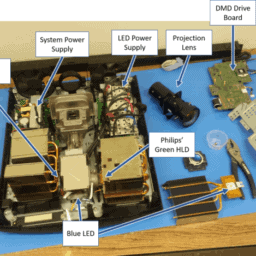 Let’s take apart a 4K UHD projector and see what’s inside!